Sheet pan lemon turmeric chicken and potatoes is a hearty meal made all on one pan! 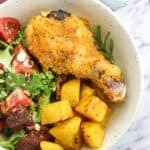 Chicken drumsticks are coated with a turmeric and spice breadcrumb mixture and baked alongside potatoes until juicy and tender. Preheat oven to 425°F. Add all potato ingredients to a large mixing bowl and toss to combine so that the potato pieces are evenly coated. Pour out potatoes onto a large rimmed sheet pan and push them towards the exteriors of the pan, leaving room for the drumsticks. Brush the excess liquid on the center space to help keep the drumsticks, when they're added, from sticking to the pan. Add eggs and lemon juice to a shallow dish and beat with a fork. In a separate shallow dish, add breadcrumbs, garlic powder, turmeric, paprika, thyme, salt, and pepper. Dip each drumstick into the egg mixture, and then into the breadcrumb mixture, taking care to press the breadcrumb mixture on the drumstick to adhere to all parts. Repeat for all drumsticks, placing them in an alternating fashion in the open space on the sheet pan. Bake for 25 minutes, then remove and baste each drumstick with olive oil. Flip each drumstick and potato over, and then place back in the oven to bake for an additional 25 minutes, or until the potatoes are fork-tender and the chicken reaches 165°F. Let stand for a few minutes, squeeze lemon wedges over top of chicken and potatoes, and serve. The sheet pan I used is roughly 13" x 17 1/2" and was fairly full, so use your largest pan (or separate everything into two pans). Nutritional info takes into account keeping the skin on the chicken drumsticks.